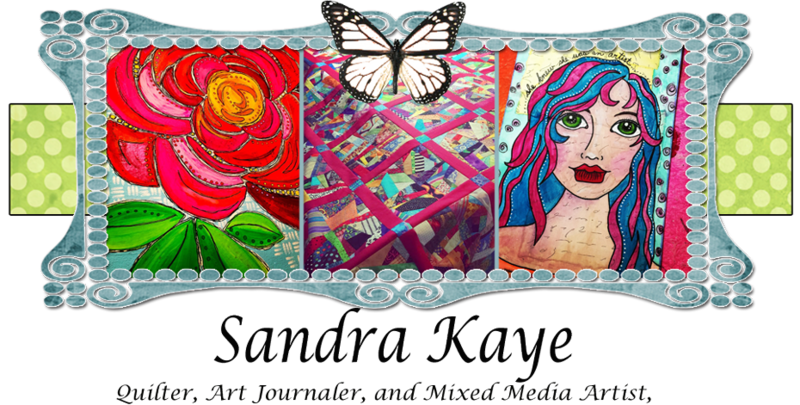 Sandra Kaye: Mixed Media Friday!!! 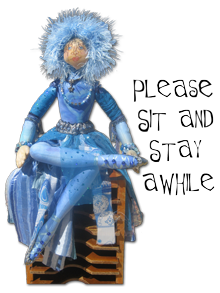 I have been catching up on my mixed media projects... and starting some new ones. The above page is my traveling art journal to my friend Lori in Florida. We both have a book and we work on each book..then we switch books and do it again. 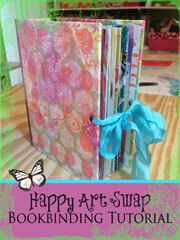 One day the books will be full, and we will have art journals filled with art from both of us! We all have things in our past that we tend to drag around with us. 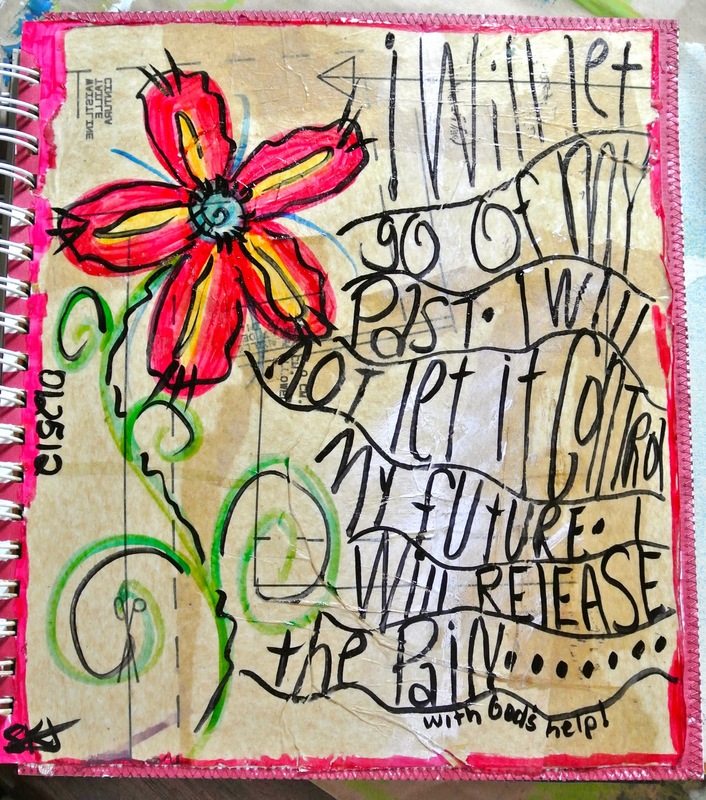 This page is me saying I will let it go. My word for this year is RELEASE. You will see that word pop up on a lot of my journal pages. I started an altered book journal called Book of Days. You take an old book and paint and journal in side of it. I think we are suppose to journal every day, not me... I will do at least once or twice a week. The book I decided to use was a diet book I never used. (anybody have any of those? 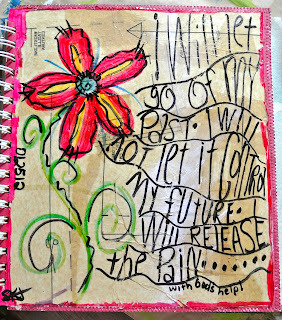 :):) I am turning this book into an art journal, focusing on the word... RELEASE. 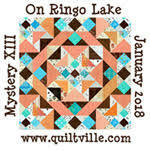 Effy is hosting this for free on her blog Love and Glitter. She has great video's as well. 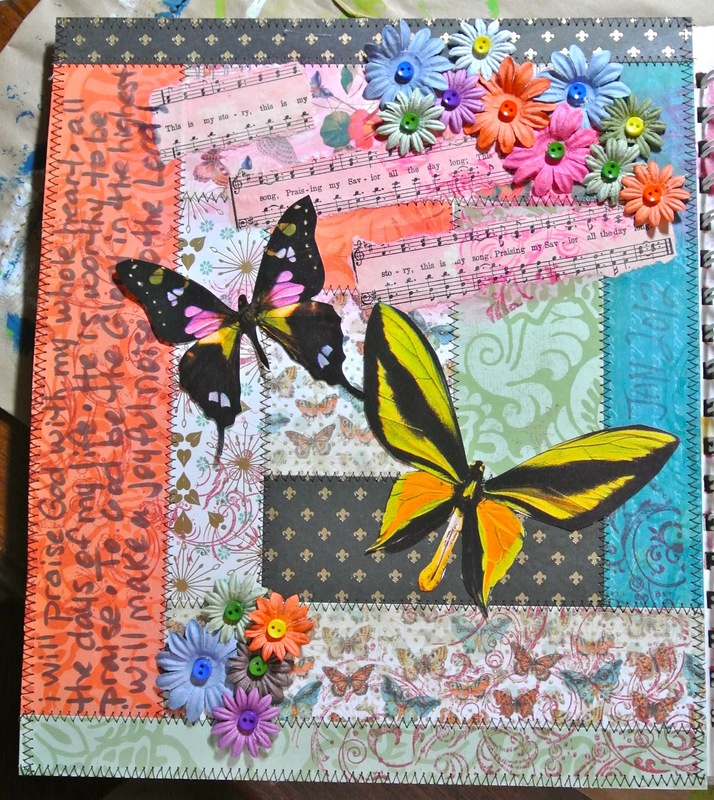 Then Tam over on Willowing and Friends is having an awesome journal class. 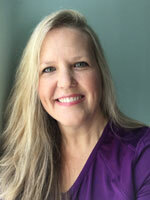 She is teaching a year long class called Life Book. Here is my first page. It has been a long time since I have done a face. Her book is about thinking positive about your self. Which is a good practice for me..I am my own worst critic at times. This is the flip out of the page above. I love the quote from the movie "The Help"
We all need to become our own cheerleader. !!! Have a great day..and I think you are all special!! Sandie, all of these pages are STUNNING! I haven't done any mixed media in a while, you have inspired me to jump back in! And I am my own worst critic too! Maybe that is why God gives us friends, to make us see the positives in ourselves! 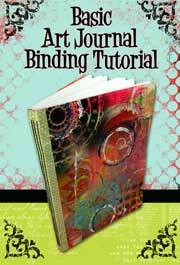 I love your pages...I will go to the link you gave and check out the tutorials. 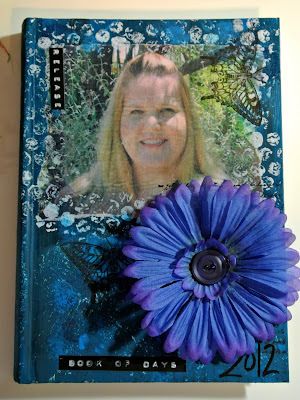 I made an altered book last year...however, I've been journaling for many many years. I wish I could say I do it every day but sometimes I go weeks without doing it and then have to summarize. It is better to do it weekly at least. 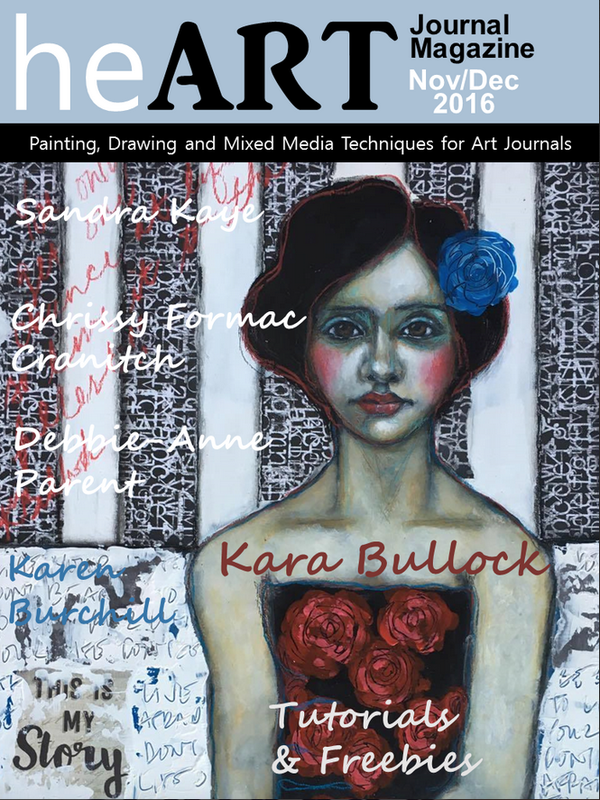 There is so much in those journals and I like to go back occasionally and read them. Wonderful works of art. You've chosen such a strong word and created beautiful designs. I can see you're releasing, but a huge part of what I also see is you embracing the positive! Happy day, happy girl! 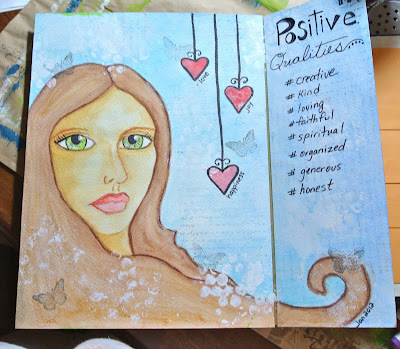 Your post makes me want to go in right now and do another page in my art journal! I like the idea of trading journals back and forth with a good friend! Yes a neat quote from "The Help" I read the book and saw the movie, Very Good!